Well, it is national Pancake day today! And I decided to whip up a gf pancake mix to use to make all kinds of pancakes. 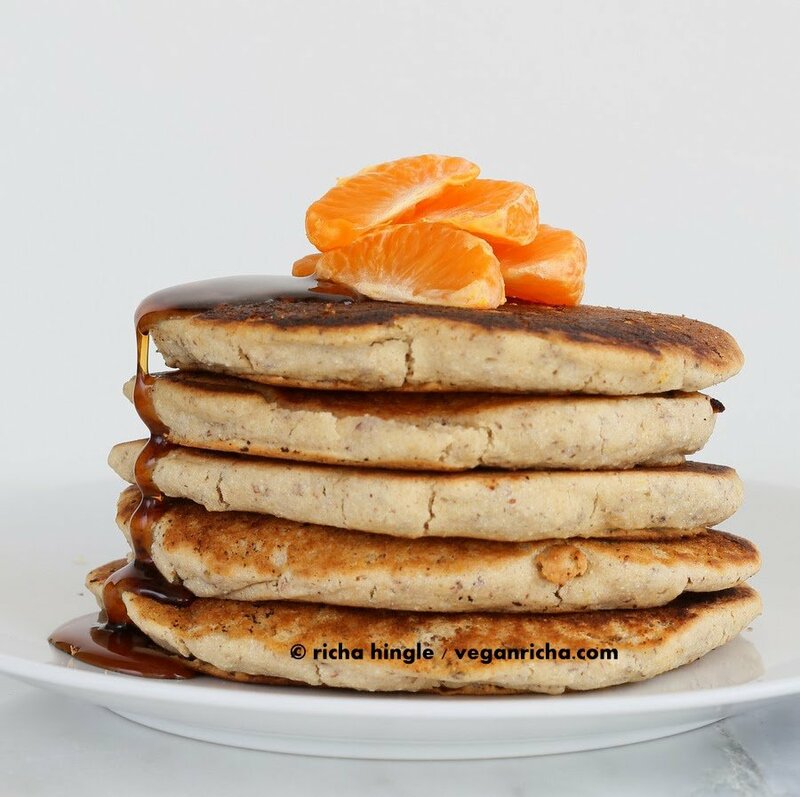 You can use this mix to make any of the regular mix pancakes on the blog or make these soft and zesty Pancakes with orange zest, non dairy yogurt and ginger. Load up with orange slices, maple, vegan butter, whipped coconut cream and serve up. More Pancakes from the blog. all of these can be made gf with my gf Pancake mix. Samoa Cookie Pancakes with date Caramel, toasted coconut and chocolate drizzle. Tiramisu pancakes with Cashew cream. My blogger friend Ann has her Ebook available now. Ann’s book – A Terminal Illness Primer for Caregivers: Lessons from My Brother’s End-of-Life Journey, tackles a difficult topic that is hard to imagine to go through. It is comprehensive resource, a sister’s touching journey, emotional, dealing with the chaos. I as a survivor and hubbs who was my caregiver at times, found things through her series on the blog that would have made our journey easier, had we known, researched or know to expect. The book is available on Amazon in Kindle format here and also as a downloadable PDF available for purchase here on her blog. 100% of the proceeds from the sale of this e-book will benefit the Charles A. Oliverio Fund at Huntsman Cancer Foundation. 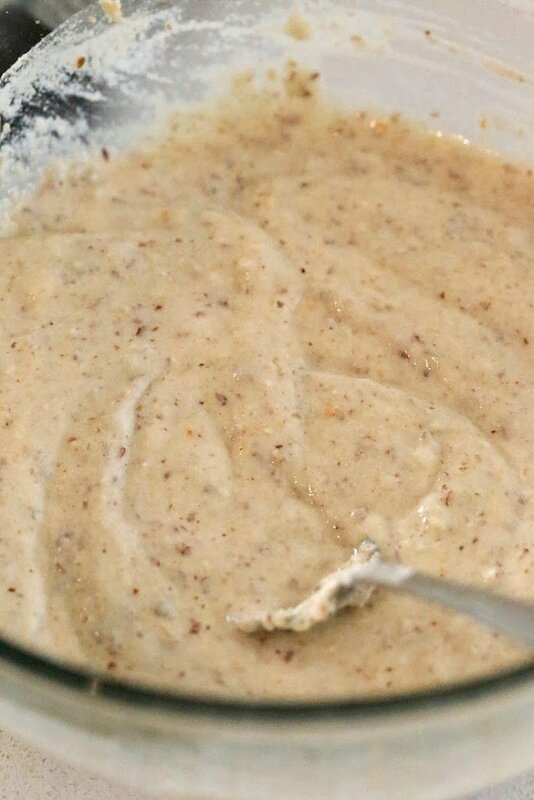 Mix the yogurt, water, orange zest and add a cup of the pancake mix to it. Ladle the batter onto a hot and greased pan. Wait for the pancakes to rise and get slightly bubbly. Cook 3-4 minutes each side. if you like less crumbly pancakes, add more starch to the pancake mix, a Tbsp more of each. Allergen Information: Free of Dairy, egg, corn, soy, gluten, gum, yeast. To make the Pancake mix: Add everything to a bowl. whisk well or sift through a sifter twice. Store in an airtight container. In a bowl, mix the yogurt, water, zest and ginger powder. 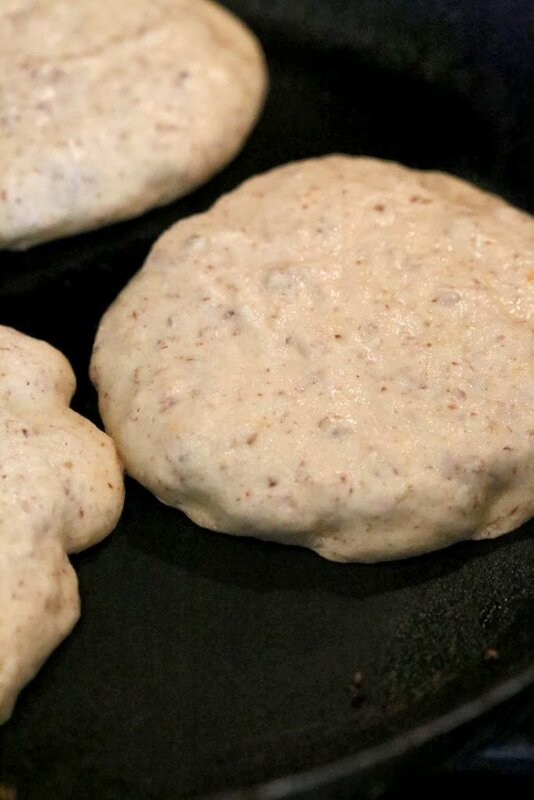 Add the Pancake mix and mix to make a batter. The batter thickens as it sits, add more water if needed. Heat a girdle/thick bottom pan, on medium heat. When hot, spread a little oil or vegan butter and add a 1/4 cup of the batter and shape. Flip when bubbles begin to form. Cook 3-4 minutes on each side or until golden brown. Serve with Orange slices, and maple syrup. In a bowl, add almond milk, water, lemon juice and mix. Add the pancake mix. Mix until well combined into a batter. Add more water if needed. Add vanilla extract or cinnamon. Make pancakes as above. Serve with vegan butter and maple syrup. These pancakes are being shared at allergy free Wednesdays. 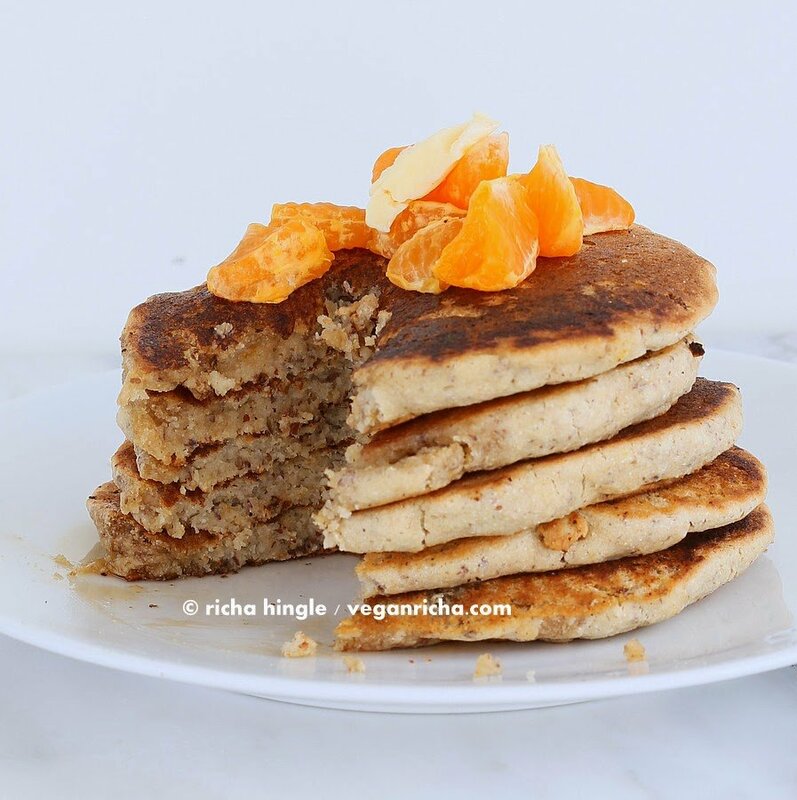 these gluten-free pancakes look delicious, richa! happy pancake day! that is quite the mix! i love that you included coconut and almond flours in there too! Perfection- love that first photo! Oh. My. GOODNESS! 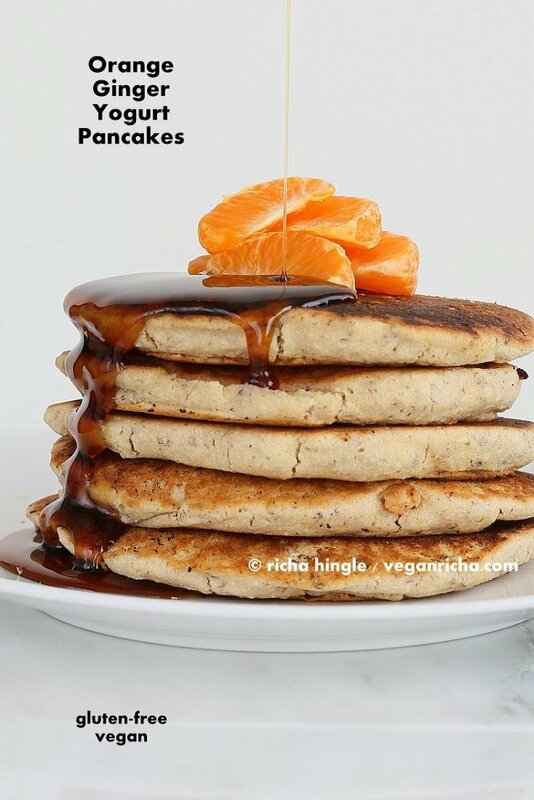 I just made these (the plain pancakes) and these are absolutely fantastically delicious! I added mini chocolate chips to the batter and used maple syrup (added to the liquid ingredients) instead of using the raw sugar. What can I sub for oat flour? I am intolerant to oats–gluten-free or not. Made these for breakfast. Yum. These pancakes were amazing!!! The first gf vegan pancakes I’ve made that have worked beautifully and tasted just like regular pancakes! 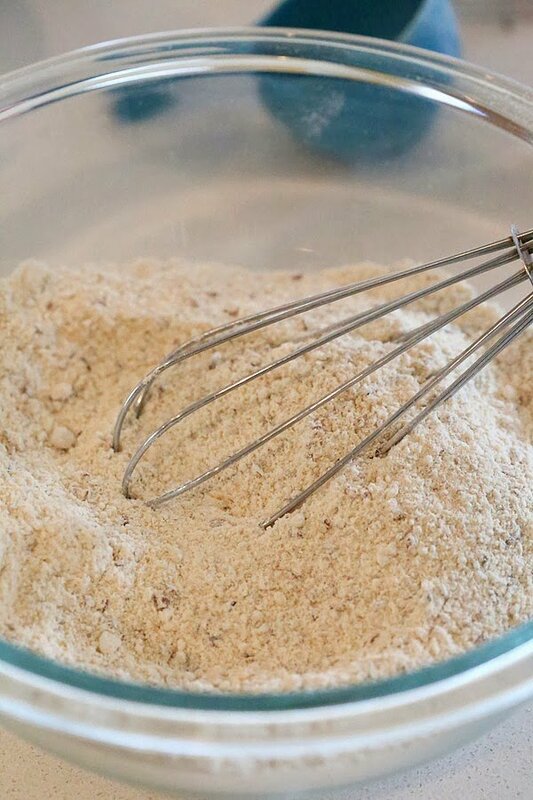 I didn’t have any amaranth, oat or coconut flour, so for the 1/2 cup oat flour I used a mix of millet and brown rice flour, for the 1/4 cup amaranth I used a mix of sorghum and millet flours and for the 2tbsp coconut flour I used potato flour (also very absorbent). For the liquids I found I only needed about half of the 1/3 cup water to get the consistency right. They cooked easily, flipped well and were soft and fluffy and delicious to eat! Thank you so much! The ingredients list is long but I tend to have all of these things at home anyway and to put it all together takes no time at all 😀 I’m so happy I found this recipe! 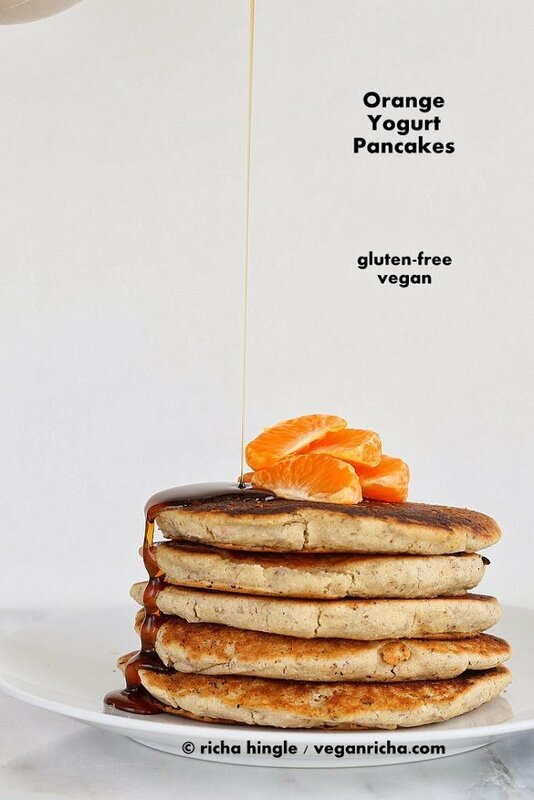 I don’t doubt that non-vegan non-gf people will love these pancakes too. My gluten free pancake mix is not making good pancakes or waffles. They always stick to the pan or waffle maker. I tried oiling the pan and waffle maker, but didn’t work. What am I doing wrong? hmm, i havent had that problem with this mix. check the following. the pan should be hot, grease the pan well, cook the pancakes till they get bubbly and slightly dry on the edges before trying to flip. was the batter thick like pancake batter? too much liquid in the batter can cause the batter to stick.